Now experiments at the Department of Energy's SLAC National Accelerator Laboratory have seen for the first time what happens when magnetic materials are demagnetized at ultrafast speeds of millionths of a billionth of a second: The atoms on the surface of the material move, much like the iron bar did. 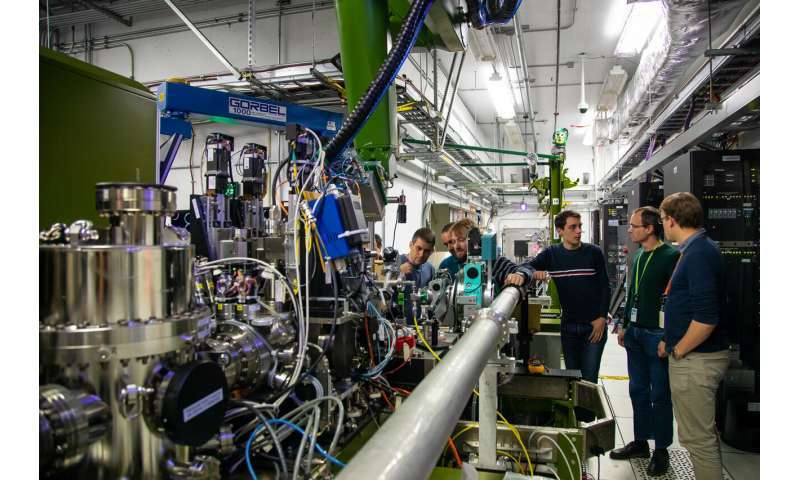 The work, done at SLAC's Linac Coherent Light Source (LCLS) X-ray laser, was published in Nature earlier this month. Christian Dornes, a scientist at ETH Zurich in Switzerland and one of the lead authors of the report, says this experiment shows how ultrafast demagnetization goes hand in hand with what's known as the Einstein-de Haas effect, solving a longstanding mystery in the field. "I learned about these phenomena in my classes, but to actually see firsthand that the transfer of angular momentum actually makes something move mechanically is really cool," Dornes says. "Being able to work on the atomic scale like this and see relatively directly what happens would have been a total dream for the great physicists of a hundred years ago." At the atomic scale, a material owes its magnetism to its electrons. In strong magnets, the magnetism comes from a quantum property of electrons called spin. Although electron spin does not involve a literal rotation of the electron, the electron acts in some ways like a tiny spinning ball of charge. When most of the spins point in the same direction, like a sea of ice skaters pirouetting in unison, the material becomes magnetic. When the magnetization of the material is reversed with an external magnetic field, the synchronized dance of the skaters turns into a hectic frenzy, with dancers spinning in every direction. Their net angular momentum, which is a measure of their rotational motion, falls to zero as their spins cancel each other out. Since the material's angular momentum must be conserved, it's converted into mechanical rotation, as the Einstein-de Haas experiment demonstrated. In 1996, researchers discovered that zapping a magnetic material with an intense, super-fast laser pulse demagnetizes it nearly instantaneously, on a femtosecond time scale. It has been a challenge to understand what happens to angular momentum when this occurs. In this paper, the researchers used a new technique at LCLS combined with measurements done at ETH Zurich to link these two phenomena. They demonstrated that when a laser pulse initiates ultrafast demagnetization in a thin iron film, the change in angular momentum is quickly converted into an initial kick that leads to mechanical rotation of the atoms on the surface of the sample. According to Dornes, one important takeaway from this experiment is that even though the effect is only apparent on the surface, it happens throughout the whole sample. As angular momentum is transferred through the material, the atoms in the bulk of the material try to twist but cancel each other out. It's as if a crowd of people packed onto a train all tried to turn at the same time. Just as only the people on the fringe would have the freedom to move, only the atoms at the surface of the material are able to rotate. 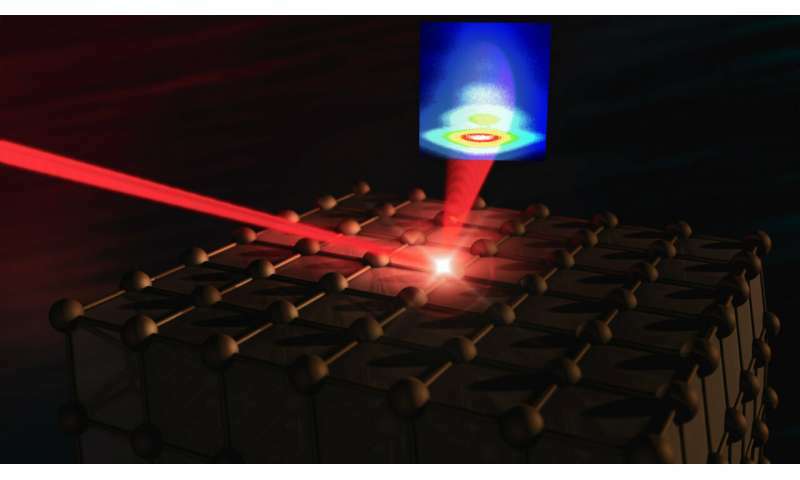 In their experiment, the researchers blasted the iron film with laser pulses to initiate ultrafast demagnetization, then grazed it with intense X-rays at an angle so shallow that it was nearly parallel to the surface. They used the patterns formed when the X-rays scattered off the film to learn more about where angular momentum goes during this process. "Due to the shallow angle of the X-rays, our experiment was incredibly sensitive to movements along the surface of the material," says Sanghoon Song, one of three SLAC scientists who were involved with the research. "This was key to seeing the mechanical motion." To follow up on these results, the researchers will do further experiments at LCLS with more complicated samples to find out more precisely how quickly and directly the angular momentum escapes into the structure. What they learn will lead to better models of ultrafast demagnetization, which could help in the development of optically controlled devices for data storage. Steven Johnson, a scientist and professor at ETH Zurich and the Paul Scherrer Institute in Switzerland who co-led the study, says the group's expertise in areas outside of magnetism allowed them to approach the problem from a different angle, better positioning them for success. "There have been numerous previous attempts by other groups to understand this, but they failed because they didn't optimize their experiments to look for these tiny effects," Johnson says. "They were swamped by other much larger effects, such as atomic movement due to laser heat. Our experiment was much more sensitive to the kind of motion that results from the angular momentum transfer." Ken Wheeler's book explains this phenomenon. This article makes it sound like these researchers don't know what a magnetic field is. I haven't read the paper yet. Ken Wheeler is a crank. i got a spinning top when i was 4; found a broken magnet that repels at point of break? Expain; either the Top or the Broken Magnet? All I got is Charge! ...and yes, Wheeler is a crank. Doesn't "believe in" electrons. Granville....your comment is illustration of principle of electric motor with no armature windings, just a permanent magnet(s) system. Well taken. fuzzywuzzy... when a magnet breaks, the broken pieces become magnets themselves. Add up the total magnetism of the parts and you will approach the strength of the original whole.